In a world of globalised media, Japanese popular culture has become a signifi cant fountainhead for images, narrative, artefacts, and identity. From Pikachu, to instantly identifi able manga memes, to the darkness of adult anime, and the hyper- consumerism of product tie- ins, Japan has bequeathed to a globalised world a rich variety of ways to imagine, communicate, and interrogate tradition and change, the self, and the technological future. Within these foci, questions of law have often not been far from the surface: the crime and justice of Astro Boy; the property and contract of Pokémon; the ecological justice of Nausicaä; Shinto’s focus on order and balance; and the anxieties of origins in J- horror. 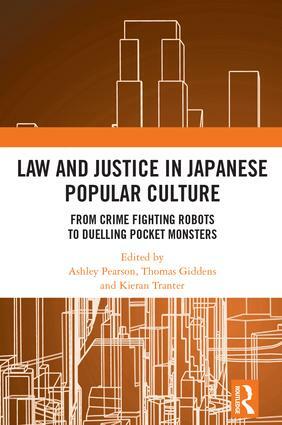 This volume brings together a range of global scholars to refl ect on and critically engage with the place of law and justice in Japan’s popular cultural legacy. It explores not only the global impact of this legacy, but what the images, games, narratives, and artefacts that comprise it reveal about law, humanity, justice, and authority in the twenty-first century. Ashley Pearson is a PhD candidate at Griffith University, Gold Coast, Australia. Thomas Giddens is a Senior Lecturer at St Mary’s University, Twickenham, United Kingdom. Kieran Tranter is an Associate Professor at Griffith University, Gold Coast, Australia.